I’ll never forget the first lesson we learned on the very first day of culinary school. It was basic knife skills or taillage in French. Taillage is the method of achieving even knife cuts. All professional chefs must master their knife skills to be successful, but perfecting knife cuts is just as important for home cooks because it ensures even cooking. 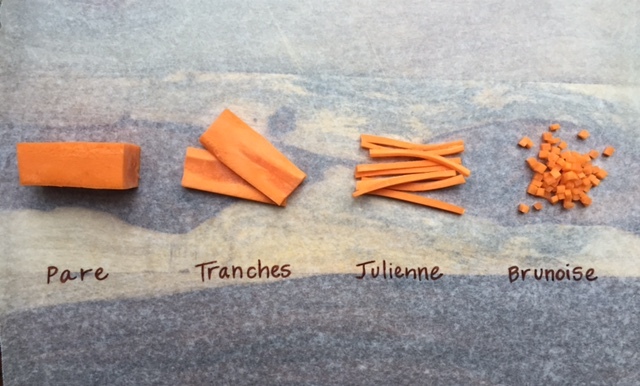 Cutting a carrot into a julienne is one of many shapes used in French taillage. With this easy step by step How To, you can learn the traditional way to cut different veggies. With taillage, practice makes perfect! So continue to work on your knife skills and you’ll be a pro before you know it. Check out How To Julienne a Carrot here, only on Coffee, Cabs and Bar Tabs. Also, make sure to follow CCandBT on Instagram, @coffeecabsandbartabs, for all the latest blog posts and tasty images from around NYC.